Stevia is the short name of the Stevia plant and the derived sweeteners. There are many good qualities ascribed to the substances from the Stevia plant. Sweeteners based on Stevia rebaudiana are mainly used as a sweetener in Japan. Although the plant is used in the countries of origin for centuries as a sweetener, was applying it in concentrated form (stevioside or rebaudioside) in foodstuffs to 2011 not allowed in the European Union, except France. This is because the safety of stevia according to the Scientific Food Committee of the European Union is not taken for granted. Steviolglycosiden is the name for a mixture of sweeteners, which are won from the stevia plant (Stevia rebaudiana). 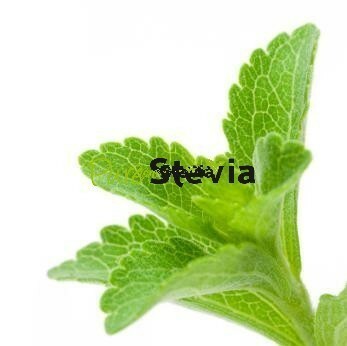 Stevioside and rebaudiosiden are the main components in the leaves of the stevia plant are found. This steviolglycosiden may be used as sweeteners. The French Government has Steviolglycosiden in Europe in 2009 officially allowed it to stevioside related rebaudioside A as a sweetener. In 2010, the EFSA voedingssmiddelen the use of steviolglycosiden as a sweetener in rated as safe. End 2011 steviolglycosiden were included in the European list of food additives with E number E960, whereby Stevia since then to a rise begun. In Japan, China, South Korea and Brazil are steviolglycosides long been allowed for internal use. In the origin field of the stevia plant, the border area between Paraguay and Brazil makes the legislature no problem of using stevia extract as a sweetener that already has a centuries long tradition. In Netherlands have now been also several products on the market that are sweetened with steviolglycosiden. Stevioside is a natural sweetener, extracted from the leaf of the stevia plant (Stevia rebaudiana). Stevioside has a strong sweet power (up to 200 times stronger than sugar), and has virtually no calories, so hardly delivers energy. It is one of the components of the steviol glycosides, which since 2011 are allowed as a sweetener (E960) in the EU. In certain studies, it is mainly Stevioside that has positive features, more so than Rebaudioside. Rebaudioside is the name of six glucosides with (rebaudioside A to F), those found in the leaves of the plant Stevia rebaudiana. Rebaudioside A is, on stevioside after, the most common of the various stevia glycosides in. It is about 400 times as sweet as ordinary sucrose (sugar). Because the leaf is less in percentage terms rebaudioside its price higher. Rebaudioside is usually indicated by a percentage behind it. For example, you can encounter the designation RA98. The abbreviation RA stands for RebaudiosideA and 98 for the concentration. In this example, the product for 98% from RA. RA98 is opposite that of a very small quantity is needed compared to normal sugar. Go but after, RA98 is about 400 times sweeter. So RA98 is equivalent to 1 kg 400 kg (!) sugar. Therefore RA98 is often mixed with adjuvants, to obtain a better control. It is important that these AIDS are also natural or derived from natural substances and not chemically, the advantage of a natural product is otherwise nullified by the additions. The control of this mould one problem, the dosages are quick to high. Steviolglycosiden consist of a mixture of Stevioside and Rebaudioside. The plant with the Latin name Stevia rebaudiana is called honey herb in Netherlands. This plant is native to South and Central America. The plant is to be found in the wild on the high plateau in the area between Brazil and Paraguay. The original inhabitants know the sweetening power of Stevia for centuries, they use Stevia as a sweetener in beverages such as maté, in herbal extracts and in medicinal drinks. In South America the plant is especially known under the name yerba dulce. For centuries the Guarani Indians of Paraguay, which use the plant, call the Caa-ehe, Azuka-CAA, Kaa-he-e or Ca-a-yupe. Most of these names refer to the sweet nectar-like taste of the leaf. Stevia is referred to by the Guarani Indians added to many of their medicines and to their diets. The Guarani Indians are one of the most developed native cultures, in the field of philosophy, nutrition and medicine compared with a similar group in the world. The perennial plant Stevia belongs to the sunflower family (Asteraceae). The genus consists of about 240 species. Only a few types have the sweet ingredients. The best known species is about Stevia rebaudiana (honey herb). The plant has its fame due to the sweeteners from the plant. The stevia plant may take up to one meter in height and has narrow leaves that up to three inches long. Growing from seed is going to be difficult because the plant is self-pollinating and not typically 13-15% of the seed germinates well, even when the seed is fresh (not older than 6 months). The plant is like hot and damp, but not wet feet. The soil can mildly acidic, sandy loam soil. At lengende days develops the journal; at shorter days the plant bloom. The plant is in May and June offered in garden centres under the name “honey spice” or “the patented name Stepa”. The plant is also used in face creams, hand creams, lip balms and ointments, feet toothpastes. Hobby breeders times sometimes the dried leaf to the powder as a sweetener to use. However, this is not allowed in commercial foods, since only the refined sweeteners allowed. The sheet contains too many substances for authorisation.